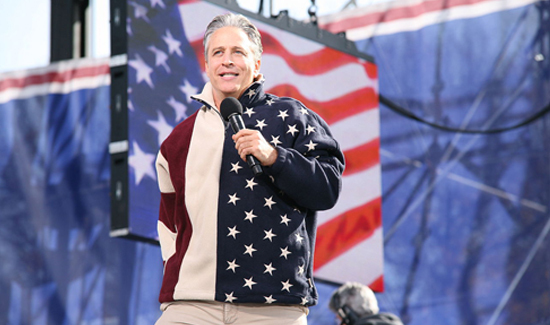 Former Daily Show host Jon Stewart is attempting to use his star power to shame Congress into permanently renewing a bill that provides health benefits to tens of thousands of first responders and rescuers who worked at Ground Zero after the terrorist attacks on the World Trade Center in 2001. In the shadow of the U.S. Capitol Building, the funny man apologized to the more than 100 rescue workers gathered at a rally on a Capitol lawn on Wednesday to renew funding for the James Zadroga 9/11 Health and Compensation Act, a healthcare and compensation program for men and women suffering from 9/11-related illnesses. Research conducted in the 14 years since the terror attacks has shown that thousands of first responders and people working and living in downtown Manhattan at the time have been diagnosed with mental and physical ailments related to the attack. It is estimated that more than 85 NYPD police officers and more than 130 FDNY firefighters have died from illnesses attributed to their exposure to dust and toxins at Ground Zero, according to Citizens for the Extension of the James Zadroga Act, a lobby group.